I embossed the sentiment from Endless Birthday Wishes in gold, added a gold butterfly, gold and black sequins, and a black glimmer paper banner! The hearts on the vertical banner are gold too...it's very luxe! I used Little Numbers and the stars from Holly Jolly Greetings! Thanks for visiting today! Oooh I love this LeAnne! That little snippet of gold sequin trim is the perfect embellishment for this gorgeous card, which I have already pinned for future inspiration! Wow! This is perfect for an 80th birthday! I love the butterflies on the DSP. The gold sequins added just the right touch! Wow this is lovely! Great papers and texture and the shine of the gold is what makes this card so special! Thanks for playing with Just Us Girls! 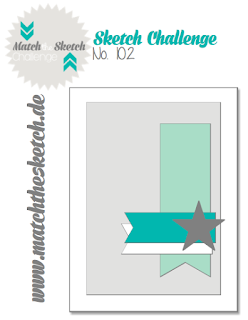 Love how you've used the sketch! Great focal image and all that golden shine is super! 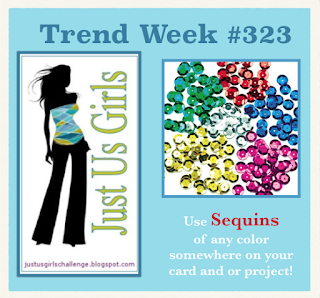 Thanks for joining the challenge at Just Us Girls this week! What a stunning card! Love all the gold touches and your take on that sketch! Thanks for joining us at Just Us Girls!